OMG you guys! We’re getting a Root RPG!!! Leder Games and Magpie Game have agreed to a multi-year licensing agreement to produce a tabletop roleplaying game set in the world of Root: A Game of Woodland Might and Right. 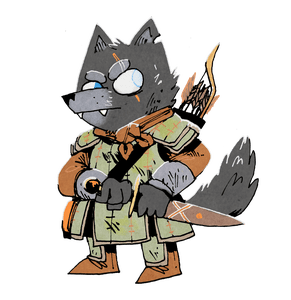 Based on Root, an asymmetric game where multiple animal factions ear over the woodland, in the RPG players will get to take on the roles of vagabonds, neutral characters who are looking to find fame and fortune among the growing strife. You can choose to join one of the factions like the Marquise de Cat, the aristocrtic Eyrie Dynasties, or perhaps the revolutionaries making up the Woodland Alliance. Then again, you could always go it alone. The Root RPG Kickstarter is scheduled for mid-2019 and will fund the production of the Root RPG Core Rulebook, with plans to release the game and further supplements into retail in early 2020. For more information about the game, fans can register for updates and announcements at www.rootrpg.com. Bonus news! For fans of Root who will be attending Metatopia 2018 in Morristown, NJ, Magpie designer Brendan Conway will be on hand to run early demos for the Root RPG!